Damn, looks like this is becoming a food blog, I need to move past posts on food as far too many good blogs on Thai food. Yesterday I wrote about Jook and eating breakfast. Today I had a totally different style of breakfast- 3 items on rice. As you wander around Bangkok and look at the food on offer from street venders and in food stalls, you’ll notice many have pans of food. Ordering is simple, the seller will scoop out some rice, you point to the dishes you want and that’s it. 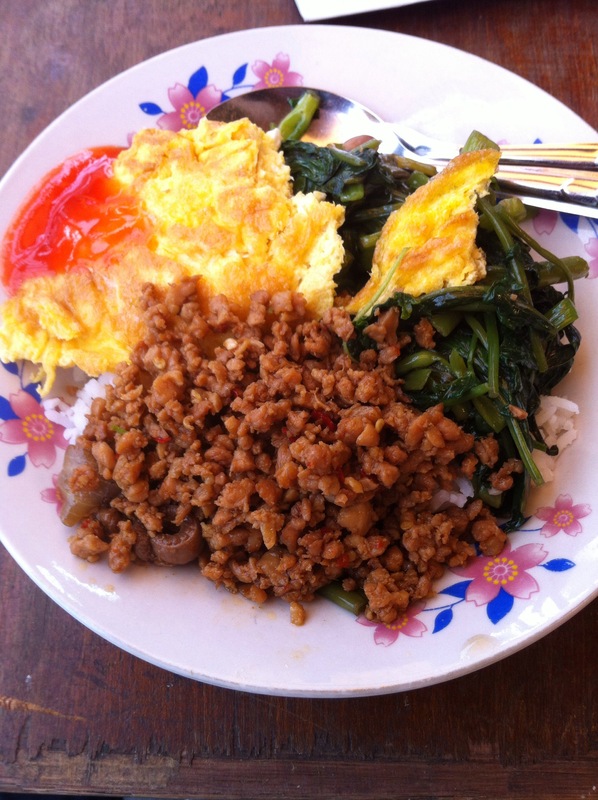 My meal was egg, stir fried veggie and spicy ground pork- three good flavors and a great breakfast (if you’re in the mood for rice and spicy food for breakfast) for thb30. Suggestion- if you are going to buy this kind of food, go to a busy vender/stall, avoid the sellers that seemed to have cooked the food prior and left the food sitting out all day. This entry was posted in Food & Restaurants and tagged street food, thai food. Bookmark the permalink.